When I was awoken the other morning at 6am I assumed that the normally easy going cats had had a major falling out so intense was the noise. On coming downstairs they all seemed to be in one bit but the scullery was devastated- washing powder and conditioner thrown everywhere, fridge socket (together with socket) pulled from the wall, ripening peaches squashed – and the unripe avocado had disappeared. Unwittingly I had locked her in the previous night. I assume she had gone when I went out later that morning to see Keri Cronin about the project she is running on women around the globe who are changing the world for animals,called the Unbound Project. On my return some 9 hours later I discovered my latest mistake of (further) unwitting incarceration. The scullery was again devastated . 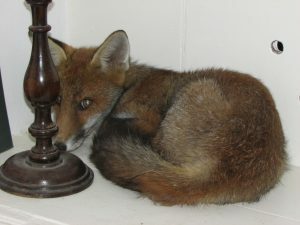 My clever cats showed me where the fox was now hiding – in their own favourite spot behind the sofa. Eventually through the smell of cooking food, enticing her out with cat food, open windows and dimmed lights she finally left. I still don’t see why some people are frightened of foxes and while I am pleased I took her photo I nevertheless wish she had brazenly strolled out of the house on the previous evening! Clearly the Hastings foxes don’t have the inner city swagger of their fellow creatures I was used to in Hackney. One of my greatest joys is seeing a fox quizzically observing me from a wary distance; we are so fortunate to share our environment with these beautiful and intelligent creatures. Not sure I fancy one in the living room though…… Maybe he wanted to borrow a book?